Today, most businesses take a “take, make and dispose” approach to create their products, without much thought as to where these products will go when we dispose of them. But a movement is underway to redesign traditional business models for the reality that resources are limited. The alternative, circular economy, which takes an end-to-end view of how materials are sourced and used to build products, is taking shape among businesses of all sizes. In a circular economy, products are designed and produced to minimize waste. As this model gains traction, more people are realizing that it can benefit the environment and contribute to business growth. In this two-part blog series, we discuss how and why businesses are transitioning from the traditional, linear economy to a more sustainable circular economy. In this first post, I look at the differences between linear and circular economies, and discuss Dell’s goals for and journey to a circular economy. In the second, Coming Full Circle: Small Business and the Circular Economy, I discuss how two small business owners are applying this model, and how your small business can put this concept to work. The traditional, linear economy is about taking resources, making products and disposing of them. Not much thought goes into where these products will go when we dispose of them, or whether materials can be recovered and reused. For example, think about all those bright and shiny objects that we all love–from PCs to fitness bands, tablets to TVs, servers to phones. To produce these products, manufacturers source the raw materials that go into these devices, such as copper, mercury, gold, silicon, platinum and petroleum, from around the globe. The journey continues with stops at refineries and smelters, chip fabrication plants, and assembly lines, where products are assembled and shipped. An amazing journey to be sure, but what happens to the old stuff when we trade it in for brighter, shinier new models? Unfortunately, the answer is not a pleasant one. 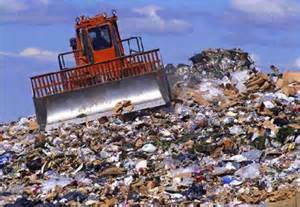 Most of the trash we create goes to landfills and dumps, creating environmental and health hazards. In many cases, we are also depleting a finite supply of non-renewable resources. Today, the linear economy is the norm: The United Nations University reported that only one-sixth of the 46 million tons of electronics that were discarded last year were recycled or reused. However, as resources are exhausted and the population grows, the linear model isn’t sustainable. In contrast, the circular economy takes an end-to-end view of how materials are sourced and used to build products. It requires companies to take a fresh look at their business models, product planning and design, materials sourcing and management, and supply chain collaboration. In this model, products are remade, repaired, resold, or recycled. By recycling products, components, untapped resources and materials back into relevant value chains, a circular economy enables economic growth with less wasted resources. It reduces toxic waste in dumps and landfills, and helps address the problem of the increasingly scarce supply and growing costs of raw materials. While economic considerations are a key driver for the circular economy, businesses are also seeing more demand from consumers for sustainably produced goods and services. Dell has taken a proactive stance to transition to a circular economy for over 20 years. In 1994, Dell began its “Design for Disassembly, Upgradeability, Serviceability” initiative, and became a founding member of the U.S. EPA’s Energy Star Program, integrating energy efficiency into every product line. Ten years ago, Dell established a partnership with Goodwill to offer consumers a free, easy way to recycle electronics. Consumers simply drop off their unwanted electronics, regardless of brand, at Goodwill. Goodwill determines whether a device can be resold or refurbished. 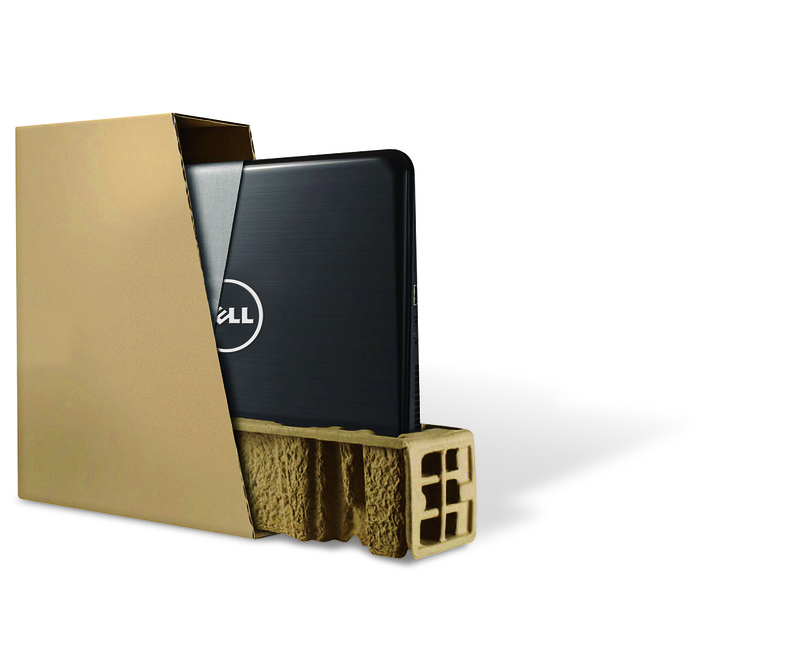 If not, it sends the product to Dell’s third party electronics recyclers to recover precious metals, plastics and other components. Two years ago, Dell significantly upped its commitment when it announced its 2020 Legacy of Good Plan. Among the 21 corporate responsibility goals outlined in the plan, Dell has set 12 goals specific to environmental sustainability. Building on existing initiatives, these 12 environmental goals focus on three areas: reducing the environmental impact of company operations, driving social and environmental responsibility in the industry and supply chain, and promoting technology’s role in addressing environmental challenges. Dell’s goals are far-reaching and specific, and include plans to reduce the energy intensity of its product portfolio by 80%, decrease greenhouse gas emissions from facility and logistics operations by 50%; and reduce Dell’s use of fresh water in water-stressed regions by 20%. Other goals include ensuring 90% of waste generated in Dell-operated buildings is diverted from landfills, to source 100% of product packaging from sustainable materials, and to recover 2 billion pounds of used electronics. Dell’s commitment to minimizing waste is evident throughout the company. For instance, Dell is designing its products with fewer screws and more snap in pieces to make it easier for recyclers to dismantle them. It has free electronics recycling programs for consumers in 78 countries, and provides commercial asset recovery to businesses in 44 countries. 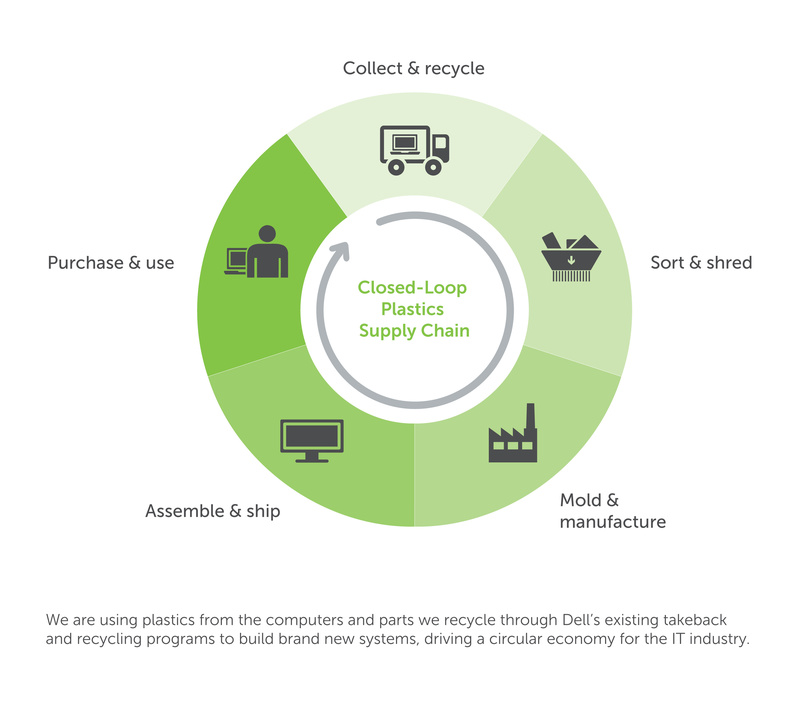 Through its closed loop approach, Dell also reuses about 2 million pounds of recycled plastics in fifteen products. The company is innovating in packaging as well, using renewable products such as bamboo, mushrooms and most recently, wheat straw. Wheat straw is what’s left over after wheat grain is harvested. In China, the wheat straw is often burned, leading to air pollution. Dell is now using about 200 tons of Chinese wheat straw to manufacture boxes for its products, reducing an estimated 180 tons of CO2 emissions. Dell is also extending sourcing standards to its suppliers to help design out waste in the supply chain. For instance, in 2013, the company added social and environmental (SER) criteria to its global supplier selection process, including criteria for clean water and air discharges. Moving beyond products, 20% of Dell’s workforce now telecommutes, saving an estimated 13 million kWh of energy, and 6,785 metric tons of greenhouse gas emissions–and save $14 million annually on facilities expenses. Finally, Dell is helping customers build proactive, sustainable IT strategies that not only benefit the environment, but save money and streamline operations. Dell Services helps customers assess current technology practices and determine options to green up existing practices, and/or develop new approaches to meet sustainability and fiscal goals. Dell is playing a leadership role in transitioning to the circular economy. But the circular economy can be as compelling for small businesses as it is for Dell and other big companies. Small businesses can apply the same principles to build more sustainable, differentiated and profitable businesses. In fact, understanding and transitioning to a circular economy can open the door to new opportunities that will help you to future proof your business. In the next post in this series, I share the stories of two entrepreneurs that have created successful circular economy businesses, and their insights as to how other small businesses can head for greener pastures. This is the first in a two-part series sponsored by Dell that discusses the circular economy; Dell’s role in it, and how small businesses can transition to and benefit from it.